342/365(+1), a photo by Luca Rossini on Flickr. It was just ten days ago that this little girl eventually decided to get out of the warm and comfortable womb of her mother and meet the rest of the world. Fact is, that womb happened to my sister-in-law’s, so this brand-new baby is another piece of family to me, my second niece, and Agata’s second cousin. I was leaving for Brussel when she came into the world, so I didn’t have a chance to visit her (and her mother Francesca) at the clinic. When I returned to Rome they were moving back home, and needed a few days to settle down before accepting visits. Bottom line, I finally met my niece Ada today, she’s ten days old, she’s very quiet and amazingly small. The daily shot could have been nothing but her portrait, it has been kind of a tradition in this project that whenever I met a newborn I take his or her pic. When shooting newborns, I like to show how freakily small they are. Like what I did with Virginia, when I put her within her grandfather’s bookshelves, or with Diego, which was placed in a basket over a the big barrel out of his parent’s country house. 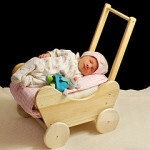 With Ada we decided to use one of her older sister Lia’s toys, a beautiful and wood carved pram. We removed the dolls from it (which, by the way, are way bigger than Ada), filled it with soft blankets, and put Ada on it for a few shots. Now, the tricky part with this kind of shots is to get a somehow studio-photography look without using a background or strobe lights (which I don’t usually bring along!). We set the “subject” over the dining table, under the table lamp, and opened (just for the time of the shots) the windows behind her. The resulting light fall created the effect of a black background, while light was both powerful and diffuse enough to gently lit Ada, the pram, and the light-yellow blanket we used to cover the table. So, here is Ada, a quiet, doll-size human being in her very first days of living (in the world). I now know for personal experience how much and how quickly she will change in the next few months, eventually becoming a little person, with her character, her vulnerabilities, and her virtues. We talked yesterday night about sincerity in comunication. And here not a single word about you opening a window (a 4×2 meters window) + something like midnight + 0 C° outside, to avoid I don’t know what kind of reflections on your lens… And so, it’s easy to discover the first vulnerability of Ada: his NEX-7’s uncle during wintertime. Anyway, it’s nice to have you on these pages! So let’s talk about the positive side trough a public message: Rossinis are lucky. All the things we talked yesterday – were finally realized this morning! (Also the Salvatore issue) So my suggestion is: invite them for dinner. Also if they will try to kill someone of your family. I’m so happy for Salvatore! And for your projects too. Hi Luca, finally I have had your “gifts” printed out. A marvelous 170X113 “canvas sur bois, matte print” and five smaller size food related pieces that will be the major artworks in our living room and kitchen. Good to say the professional photo lab handling the quite unusually high-quality shots printing ordered by the off-the-street-layman asked me who the author of the photographs was. indeed, your website will be soon visited by some of the photography professionals here in Brussels… good seeds stem good trees. Good luck with your project(s) and… grazie!!! I’m glad you liked the prints!